Ask RP Photonics for advice on details of laser designs, e.g. concerning the best way to suppress parasitic lasing. In a rod or slab laser, total internal reflection and Fresnel reflection at the side faces of the laser crystal often lead to unexpected closed ring paths. In a thin-disk laser, the gain in directions transverse to the laser beam can be significantly higher than in the longitudinal direction, so that even weak reflections from the edges of the disk can lead to parasitic laser operation. As power scaling of a thin-disk laser involves a systematic increase in the ratio of transverse and longitudinal gain, parasitic lasing becomes a more serious challenge at higher power levels. 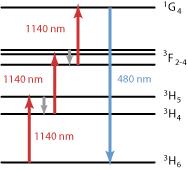 In a fiber laser containing bulk optical elements, the Fresnel reflection from some fiber end may cause parasitic lasing even if the actual laser resonator is interrupted at some place (e.g. with a Q switch). Similar effects can occur in a high-gain fiber amplifier. Such problems may be suppressed e.g. by using angled fiber ends, where the reflected light is not guided by the fiber core. Even from within an optical fiber, Rayleigh scattering can cause parasitic lasing. The tendency for parasitic lasing is highest when there is a high unsaturated laser gain. This is the case e.g. in Q-switched lasers during the pumping period. In borderline cases, parasitic lasing may occur only at low pulse repetition rates, where the stored energy in the gain medium is higher. It is not always simple to diagnose parasitic lasing. For example, when observing a laser crystal with an infrared viewer, it can be difficult to distinguish effects of parasitic lasing from those of parasitic reflections of laser light (without a closed beam path), or from pump light which may also be scattered in different directions. For sufficiently high gain (e.g. several tens of decibels), there may also be amplified spontaneous emission (ASE). 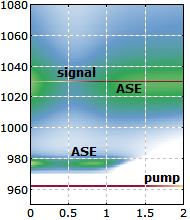 The optical spectrum usually exhibits sharp and unstable peaks in the case of parasitic lasing, whereas ASE leads to a spectrum with a smoother shape. The dominating detrimental effect of parasitic lasing is usually the unwanted extraction of energy, which leads to gain clamping and may thus prevent the intended lasing altogether or at least limit its power or the pulse energy. It is also possible that parasitic lasing leads to the emission of coherent light in unexpected directions, which can constitute a laser hazard.